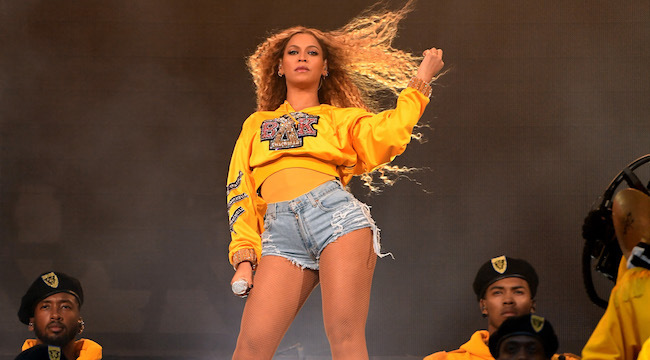 Beychella: Beyonce snatched edges and made history with Coachella performance - Ooooooo La La! Beyonce shut down Coachella with a spectacular performance late Saturday night! Queen Bey opened her long-anticipated performance singing “Crazy in Love” accompanied by a New Orleans-style brass marching band, and later crooned a rendition of “Lift Every Voice and Sing,” also known as the black national anthem. "Y'all ready Coachella?," she asked the crowd as she opened her set, becoming the first woman of color to headline the music festival in Indio, California. Excited fans had a new nickname for this year's festival: Beychella. Other headliners included the Weeknd and Eminem. "Coachella, thank you for allowing me to be the first black woman to headline," Beyonce said, before singing "Run the World (Girls)." For nearly two hours, Beyonce snatched our edges as she sang several songs from her album Lemonade, backed up by the band and surrounded by step dancers as well as older songs, some that she hasn't performed in awhile, like "Check On It," "Deja Vu" - which she performed with her husband, Jay-Z, and "Get Me Bodied" - where she danced with her sister, Solange. Bey also included a tribute to Nina Simone and quotes from Malcolm X. Towards the end, Beyonce even thanked the people watching at home for staying up late! Yassss, she thanked me! I was up until 4 something in the morning having a party in my room! Bey and Jay will kick off their joint tour this summer. And, I can't wait to see them in August! Beyonce & Solange's dance off! This entrance and that walk! Even Rihanna was front and center! Looking for promo? Read more info here!